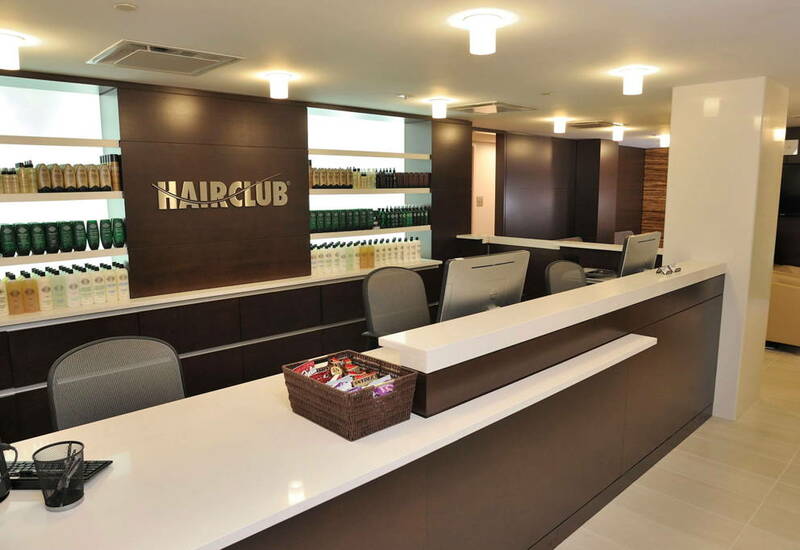 Hair Club Vaughan is located in a dark glass building. Our office is on the second floor. There are two names on the building, Alexion and Lorwood. The building is on the northwest corner of Jane Street and Rutherford Road. Please use the main entrance of the building located facing Rutherford Road. Our building is in a strip plaza called Julliard Centre. There is an All Stars Wings and Ribs and McDonalds right beside our building. IMPORTANT NOTE: On Saturday and weekdays after 6pm, please enter code 0203 to gain entry into the building. Nearby Cities Reference: West of Vaughan: Brampton --North, West of Vaughan: Orangeville, East of Vaughan: Thornhill, North East of Vaughan: Richmond Hill. Our building is on the northwest corner in the Julliard Centre, the building has two names Alexion and Lorwood. Excellent service and staff are awesome. Great place , close to home , staff very friendly and helpful , great results. I’ve been going to Hair Club for over a year and have always been satisfied. Recently, I had a situation where the lace somehow became dislodged from my head shortly after an appointment. I called on the Saturday before Christmas in a bit of a panic, and the Vaughan staff made sure I was fit in, in between other appointments on what must have been an incredibly busy day. I’m very thankful for their support and help. Thank you! Unbelievable staff Mika and Heather go out of their way to make sure you are fully taken care of. Always friendly and accommodating. Have me as a client for life! Best thing I have done for myself. I no loner worry about my hair loss after years of tears!!!! Everyone here is so lovely and kind. much appreciated! I have been a client for almost a year and my experience through this time has been exceptional. This location provides excellent service the staff is very friendly and helpful. I definitely recommend this location. I feel like a rock star whenever I leave. Best team ever!!!! My stylist Shannon rocks!!!! Exceptional service and courteous staff. I would recommend to anyone seeking hair loss treatment. Vaughan location staff are number one!!! If any questions or concerns, they are always there for me. They are very caring, friendly and easy to talk to. Amazing people, always make me feel welcomed and treat me well. feel like part of the hair club family!! Hair Club has changed my life from no confidence to full of confidence.. Staff is very friendly and professional.. Amazing service.. I would recommend everyone whos struggling with hair loss to give Hair Club a try specially this location in Vaughan.. WHEN I CAME TO HAIR CLUB I WAS A SKEPTIC, BUT AFTER 1 YEAR I AM SOLD. HAIR CLUB SAVED ME. I WILL ALWAYS BE GRATEFUL. THE STAFF ARE WELL INFORMED, FRIENDLY AND CARE ABOUT THEIR CLIENTS. THANK YOUR TO ALL THE STAFF AT HC RUTHERFORD! Excellent service, excellent stylist and all the staff are amazing at Hair Club Vaughan. Heather is an amazing manager of Hair Club Vaughan. Great people , great service, all around great experience. I have been a Hair Club client for the past five years. I am very happy with all the staff at Vaughan location. The atmosphere is very relaxing. I recommend everybody with hair loss to come to Vaughan. I have no regrets in becoming a Hair Club client. I started my hair treatment in 2014 at the North York location and moved to the Vaughan location once it opened up. The staff at Vaughan are great at listening to my hair needs &amp; likes and provide me with options. I love the great quality hair that match my natural hair and the bio-matrix system is undetectable. I have been a client of Hair Club for 6 years. I am very happy with all the staff at Vaughan location specially my stylist Shannon. Susanne and Heather are also amazing at what they do.